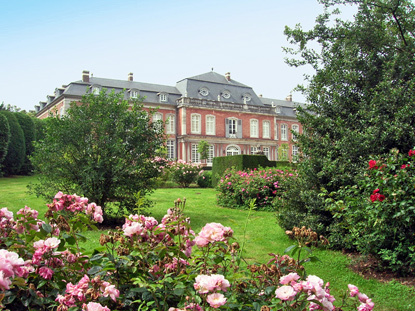 Hex is a classical castle built for a Prince-Bishop of Liège. 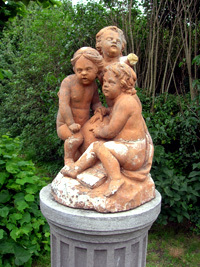 It is renowned for its French-style gardens and English-style park. 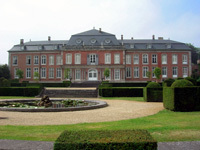 Private residence of François-Charles von Velbrück (1719-1784), Prince-Bishop of Liège between 1772 and 1784, Hex is a jewel of Rococo style almost unrivaled in Belgium. François-Charles von Velbrück was born near Düsseldorf. In 1735 he became canon priest of the cathedral of Liège, then, in 1756, Archdeacon of Hesbaye. Between 1757 and 1763, he served as prime minister under Prince-Bishop Jean-Théodore of Bavaria. As a ruler of the Principality of Liege, Velbrück was remembered as an enlightened philosopher and humanist, a nature lover, a patron of the arts, and an exponent of free education. He endowed Liège with an academy of painting, sculpture and engraving, a free school of drawing for mechanic arts, a free school of surgery, as well as free courses of mathematics and public law. All this, combined with a lasting time of peace during his whole rule made of Velbrück one of the most beloved prince-bishops of Liège in history. 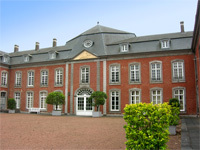 In 1770, François-Charles started the construction of his château in Hex, on an estate where his father François-Joseph had erected a hunting pavilion. François-Charles was struck by the beauty of the Hesbaye region, in the County of Looz. Upon his death, as the castle was a personal possession, it didn't go the the Principality of Liège but was inherited by François-Charles' family, passed to the Marchant d'Ansembourg, and eventually to the Counts of Ursel. Completed in 1772, Hex castle was built in the middle of an exceptional natural site, covering 5 hectares (12.5 acres) of formal French-style gardens and 60 hectares (150 acres) of English-style park. The terrain is hilly, with 60 meters of difference between the highest and lowest point. 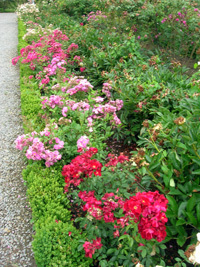 Most remarkable of all is the collection of roses, which includes a variety not found anywhere else in the world : the Rosa Velbruck Indica Centifolia, named after the original owner of the property. Let's also note the Chinese garden and the potager (vegetable garden). The park was inspired by the works of the celebrated English landscape-architect "Capability" Brown, and was on of the first of the kind on the continent itself. It has the status of natural reserve. 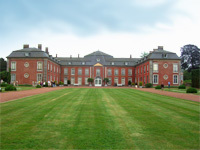 The castle is U-shaped and has a front façade of 19 windows in length (on two levels). The interior of the castle was designed in opulent Louis XV and Louis XVI styles. Some rooms have Chinese decoration. There are no less than six living rooms, each of a different colour. The main dining room is decorated with magnificent wood panelling by Liège artist Tombaye. 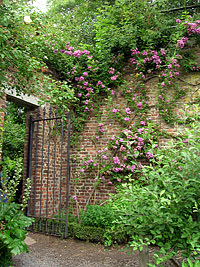 The castle itself cannot be visited, but the gardens and park are open to the public for the Festival of plants twice a year (2nd weekend of June and 2nd weekend of September ; see official website). Guided tours start every hour. Admission is 7.5 € per person. Please note that dogs aren't allowed. The rest of the year, group (max. 35 people) tours can be arranged through written request, 3 weeks prior to the visit. The tours take approximately 1h30min to 2 hours, and can be held on weekdays between 10:00 am and noon, or between 2:00 pm and 5:00 pm. The individual fee is 7.5 €, with a minimum of 150 € for the whole group (so if the group is composed of only 10 people, the fee will be 15 € per person). Hex Castle is situated in the village of Heks, about halfway between Sint-Truiden and Tongeren, 3km south of Borgloon (Looz in French). Coming by car from Brussels, Leuven or Liege, take the E40 motorway. At exit 29 (Waremme), take the N69 towards Oreye and Tongeren, continue on about 5km, then turn left to Heks once you reach Otrange. Follow the main road through the village, and pass the junction in the centre of the village. At the end of the village, there is a curve to the right, then a junction ; take the road to the left to reach the castle and its car park.